NOTE: BMW cassette radios such as the C33 and C43 do not respond to MF wheel buttons. Update your 8-series with something that should've been standard from '95-on: a multifunction wheel. The information compiled here is applicable to all airbag-equipped BMW's built since 7/90 (earlier models may have used different airbags and steering columns). Credit is due to E36 BimmerForum members vlacki and bluebook, E38 BimmerBoard members David Cecil, Qsilver7, and 04sshd; and especially 8er.org founder Martin Brügger - all of whom performed pioneering work from which I have drawn. 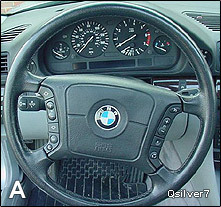 There are two smaller diameter, single-stage airbag multifunction wheels used in '97-'99 E38/39's (with slip ring '261) optimally suited for adaptation. (See below for more on the Sport 3-spoke. Wheels from '95-'96 [with slip ring '912] require a separate control module and are therefore less suitable.) This retrofit is easier for most BMW's from '95-on which use updated column switch brackets and airbag connectors, however earlier models are easily adaptable. Sport 3-Spoke: This popular wheel is made for the column-mounted slip rings on the E46 and therefore is not directly compatible. However, machining the wheel's base and other changes will allow use of the '261 slip ring. Note these two wheels offer customizable button block options. For instance, telephone buttons are optional, while wheel A may include either wheel heater or HVAC recirculation button (unusable with 8-series). Wheel B has no heat option but offers button covers. (Wheel C has no options.) Therefore, for example, wheel B could be configured with radio buttons only. 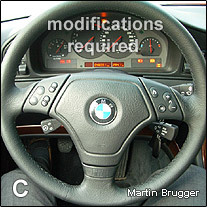 For button block details, see RealOEM wheel A, wheel B(1), wheel B(2), and wheel B(3). Heated Steering Wheel: To use the wheel A heater, you must use slip ring '262 with contact switch and matching wheel/airbag. See heated wheel for details. Functionality is achieved by using the CD43, an I-bus capable, factory CD radio. Extend the white I-bus output wire from the '261 slip ring to terminal 7 of the radio wiring harness. For those using aftermarket radios, check with the radio's manufacturer for adaptors. For those wishing to use only radio buttons with wheel B, install a right button coverafter removing the cruise button face. The wheel's radio button wiring still needs to connect thru the unused cruise button block, however. For those using factory CD changers, they will need to be replaced with newer I-bus CD/MP3 changers and data cables. See procedure section below. Integrating a hands-free "bluetooth" phone system allows more complete utilization of your MF wheel while providing real practicality. An affordable approach uses the Parrot CK3000 bluetooth kit along with the Connects2 steering wheel adaptor. See procedure section below. While adapting radio functions is simple, cruise functions are more involved. There are two possible approaches: 1) install an electronic adaptor which mimics cruise stalk output using wheel button input, or 2) swap cruise control components for those which understand the wheel buttons. Use of an electronic adaptor can be elegant and efficient. Fortunately such a device has already been developed. As of this writing, an adaptor module is available for purchase from Swiss electronics whiz and 8-series enthusiast Martin Brügger. Price: 215 CHF (about $238), price subject to change, exchange rate varies. UPDATE, August, 2017: Some people have had difficulty contacting Mr. Brügger. The information above are the only contact resources I have. Without a cruise adaptor module, swapping cruise components is your only option. But this works only for the 840Ci and its V8 engine. (All V12 models utilize circuitry integrated with the engine control unit.) Incidentally, 6-cylinder BMW's may also use this approach. 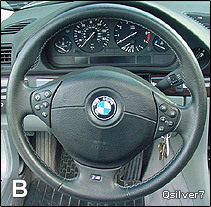 BMW used three different variations of cruise functions on the E38/39 with the most desirable being from 9/97-on. Therefore cruise modules should be sourced from 740/540's built from 9/97. New cruise modules require coding from the dealer, which is why used modules from V8 powered cars are needed. (6-cylinder cars may pull from the 528.) Unlike the cruise module, cruise actuators do not require coding and are the same from 9/96-on. A wiring diagram including part numbers is available below. Note that since I used the TMS adaptor instead, this diagram is labeled "untested". But it is based on the successful work accomplished in the E36 Bimmerforums. E38/39 Cruise Control Retrofit for E31 (840Ci) - by Frankie. Note with either option (component swap or TMS module), cruise system diagnostics (fault readouts) will no longer be available, or limited at best. Sourcing cruise parts from either a salvage yard or eBay will be the most cost effective. Procedures below. Fully lower and extend the motorized steering column before disconnecting battery! Leave the bus/power car connector of the new slip ring in place. 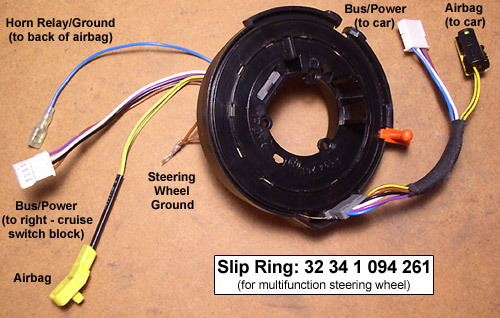 Only alter the slip ring's car airbag connector if your car originally used the '901 slip ring (thru '93), as specified in the above procedure. Pin 1 (brown) - Ground: to TMS module (if used) or other ground location under column. Pin 2 (purple) - Power: from TMS module (if used) or other 12v source (ex: cruise switch, radio). Pin 3 (black) - Cruise Bus Signal: to TMS module (if used) or retrofitted GRII cruise module. Pin 4 (white) - Radio Bus Signal: to terminal 7 of radio wiring harness. See Radio below. Pin 6 (blue) - Horn: to horn relay (existing brown/red wire under column). Tap fused power sources which are hot in accessory/run/start. For 840's, the cruise switch wire from connector pin 1 (violet/white) is ideal (see image below left). 850's may use radio pin 5 or others. Tap-in squeeze connectors are convenient. For a ground terminal use under-column location, under ignition switch (see image above right). '95-on cars are pre-wired from original '111 slip ring. Simply open the car's connector and transfer the pin 1 brown wire into pin 1 of your new connector. 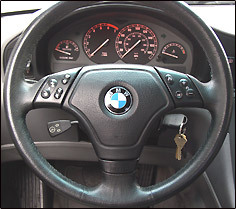 The light control module (LKM) has no input and therefore wheel buttons are lit at all times. Extend slip ring's pin 4 (white wire) to radio wiring harness terminal 7. See image below. Run the radio bus wire down right side of column along the ignition switch interlock cable to radio. Secure wire with tie wraps. To use a CD/MP3 changer, see Factory-Look Audio Upgrades. Use tap-in squeeze connector to create a Y branch for changer's I-bus line. Again, source proper wiring supplies. For example, use terminal 61 13 0 007 449 in the radio harness. 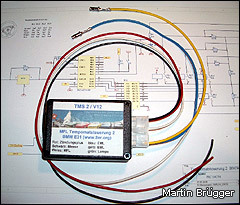 1) Refer to supplemental wiring diagrams and installation instructions referenced in TMS section above. 2) Remove all lower trim from driver side. Use heat shrink tubing after a dab of solder on your wire splices to ensure good contact and durable insulation. Secure all wiring with tie wraps. 5) You're done! Take it for a test drive! First Impressions (840): The TMS module holds speed smoothly, like a factory system, but responds a bit crudely to accelerate or resume, commanding aggressive accelerator movement with corresponding RPM surges to attain desired speeds. For those who infrequently use cruise functions, this is acceptable. But frequent cruise users who prefer smoother operation may prefer the original cruise stalk, or the component swap outlined below. - Frankie. Note: I have been informed by Mr. Brügger that his TMS module is optimized for the V12. This explains the less-than-smooth operation in my V8. This option provides factory-smooth cruise control operation versus Martin's TMS adaptor on V8 powered cars. 1) Source all parts and review wiring diagram referenced below. Cruise actuators require the matching cable and electrical connector. Mounting hardware may be needed too. If possible, open and re-pin connectors as needed, instead of cutting & splicing. Note: This method is untested in the 8-series, but has been successfully performed in the E36 3-series. The GRII cruise module offers even smoother operation than earlier factory systems, along with a cluster annunciator light. Since I abandoned this approach in favor of the TMS adaptor, additional installation details are not possible and the wiring diagram is only theoretical. However, this should provide a foundation for those proceeding down this path - Frankie.